I'm feeling a little sheepish about this recipe. Instead of succumbing to pangs of self-doubt, I'm choosing to share this with you. It's my favorite kale salad - a stunningly simple combination of sweet and bitter flavors, elegantly disguised as health food. So, go ahead and roll your eyes about my kale overload/recipe rule infractions. Just do it while shoving this glorious salad into your mouth. all amounts are "to taste"
1.) Place washed & torn/cut kale in a bowl. 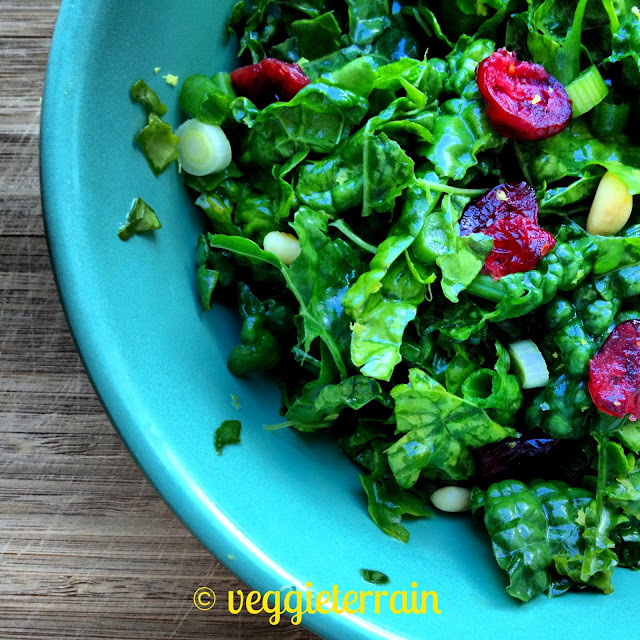 Add olive oil & lemon juice (reserving zest), & massage it into the kale with your hands. The longer you do this, the softer the kale will become - I prefer only 30 seconds or so, but feel free to give it a few minutes, if desired. 2.) Sprinkle salad with scallions, cranberries, pine nuts, & lemon zest, adding a pinch of salt for good measure. Top with a smidgen more olive oil &/or lemon juice, if you'd like, noting that a little bit of olive oil goes a long way. Serve at once. Seriously gorgeous picture!!! Can't get enough kale.